The Process - Sunworks, etc. Measure the width, length, and depth of the countertops and fax, email, mail or bring in your measurements to our showroom. 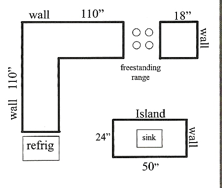 We need dimensions and the rough layout of your kitchen. With a simple drawing and measurements, including your sink, your cooking surface, and backsplash we can provide you with the most accurate written estimate possible. This helps to give us a realistic idea of what your countertops will cost. This price will be subject to change after template, depending on your final measurements and material selections. The more detailed the drawing – the more accurate your initial estimate will be. Also, please visit our showroom- we will help you choose the countertop material that is right for you. Once you have received an estimate from us and have made your final decisions on the details we will complete the contract. Measuring for your countertops occurs Monday through Friday between 8 am and 4 pm. With the paperwork in place, our scheduler will call to make the appointments for your template and your installation, usually at the same time. A template is an exact pattern-insuring a precise fit for your custom countertops. The template crew comes to your home to create the template. The same day we measure, we could begin the fabrication process. That is why we need to have all the final details in place before the template. Have cooktop and downdraft, slide-in or FSR on site. Check your cooktop/ downdraft combination to be sure it will fit in your cabinet. They rarely fit in the standard 24” cabinet against the wall. *Cabinets include end panels, refrigerator panels, decorative doors, drawer pulls, panels and any other item that will affect the shape or overhang of your countertops. ** We want to get the best possible fit to the wall if you choose to have no backsplash or a low profile backsplash. We will call you the day before your scheduled template date to confirm your appointment please advise us at this time if you will not be ready, as we will need to reschedule. Any changes made after this point may result in a delay in your project and could incur additional charges. Changes upon template – Any differences that occur between your contracted countertop and the templated countertop are subject to re-pricing. Your job may be placed on hold pending a change order. We will need all issues addressed within 24 hours in order to retain your original install date. If the issues are not addressed within that time frame, your installation could be substantially delayed. All appliances that will be placed in the countertop (including sink, faucet, cooktop, downdraft and accessories) MUST be on site at time of template. Other appliances including dishwashers and refrigerators should be on site to insure proper countertop measurement. Corbels, Brackets or Steel Supports may be required where countertops extend beyond the cabinet. All supporting structures (e.g. cabinets, columns, pedestals, etc. ) must be installed prior to time of templating (except for corbels). Corbels should be on site for templating and installed as soon as possible after we install your countertops. Sunworks Decorative Concrete will call you to set up a template time and at the same time provide you an installation date. If anything occurs during production that would impact your installation date Sunworks Decorative Concrete will call you at once. This rarely occurs. Installation of your countertops is done Monday thru Friday during normal business hours. Have cooktop and downdraft, slide-in or FSR on site. It is our philosophy to have as few seams as possible and to give utmost consideration to the placement of seams. Input from the customer on seam placement is welcomed. Sunworks Decorative Concrete will attempt to accommodate the customer’s wishes where possible. Consideration of WEIGHT, HANDLING, LOCATION LOGISTICS of moving pieces into your home (size of doors, elevators, hallways, etc.). Sunworks Decorative Concrete standard procedure for under-mount sinks is to have a 1/8″ to 1/4″ overhang on the bowl, this is called a negative reveal. Deviation from this standard procedure if requested by the customer requires a signed request for custom labor. Aesthetics, hygiene and engineering factors are the reasons for Sunworks Decorative Concrete’s standard negative reveal installation. **Schedule your plumber’s appointment for the day after your countertop installation in order to allow the adhesives to set. Sunworks Decorative Concrete can remove your old countertops and dispose of them for an additional cost. Please ask us to include this in your quotation. If you purchase removal services of countertops from us, we will remove and haul away your old countertops. We will not tear out remove or dispose of any of the tile backsplash, appliances, cabinets, etc., nor disconnect your gas. If we are removing your existing countertops, you will need to have the cook top disconnected prior to our arrival. Our service does not include repair or replacement of moldings and trim that are affected by the tear-out or installation of the new countertops. We are not responsible for any gas, plumbing or electrical work required to complete the installation of your new countertops. Although rare, unforeseen conditions can appear as tear-out is completed. You will be notified immediately if any of these are discovered. Sunworks Decorative Concrete does not provide any additional labor needed to repair your cabinets or walls. If you have existing countertops and have not paid Sunworks Decorative Concrete for removal please be sure to have all work completed prior to our arrival for new countertop installation. 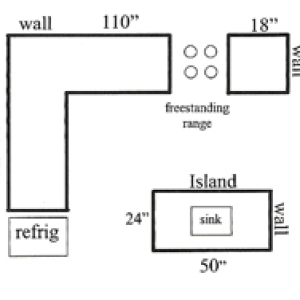 (appliance garages and bread boxes) should be on site but NOT installed prior to template. Cooktop downdrafts require three full inches of material behind it (excluding the thickness of the backsplash). Standard 24″ cabinets can rarely accommodate a cooktop & downdraft combination. Please check your design carefully. Dishwasher attachment: Dishwasher must be in place. Most modern dishwashers can be attached to the cabinetry rather than the countertop. Your plumber can take care of that when he hooks up your dishwasher. If the dishwasher must be mounted onto the countertop, Sunworks Decorative Concrete will attach it for you provided the dishwasher is permanently installed at the time of countertop installation. Installation conditions require clear and easy access from the street to the project area. Paint touch up – Keep in mind, this is a construction or renovation project and it usually involves moving large and heavy materials within your home – occasionally, although rarely, minor damage may occur to walls. You should be aware of this possibility and prepare to spackle or touch up your paint. Visible unpainted cabinetry may be noticeable after your countertop is installed. This usually occurs when older Formica countertops are removed. Installing trim that matches your cabinets below the countertop line can hide this, however this is not part of our service. If for any reason, you need to cancel your scheduled installation appointment, please give three (3) days notice so we can reschedule you efficiently and quickly. Please have your pets tucked safely away.